I’m sure I’ve mentioned this in a previous race report, but I’m Costa Rican. I wasn’t born there, nor have I spent the majority of my life there. But when asked “what” I am, either in conversation or on standardized testing, I identify myself as Costa Rican. Both my parents were born and raised there and it is home to my entire family with only a small handful of exceptions. I personally only spent my high-school years there, but those four years, combined with a lifetime of tico values have been enough to forever ally my cultural pride with the country. When I started running about three years ago, all of my races were in Chicago. Eventually, I started racing in other states, starting originally in the Midwest and then moving out to Florida and the East Coast. 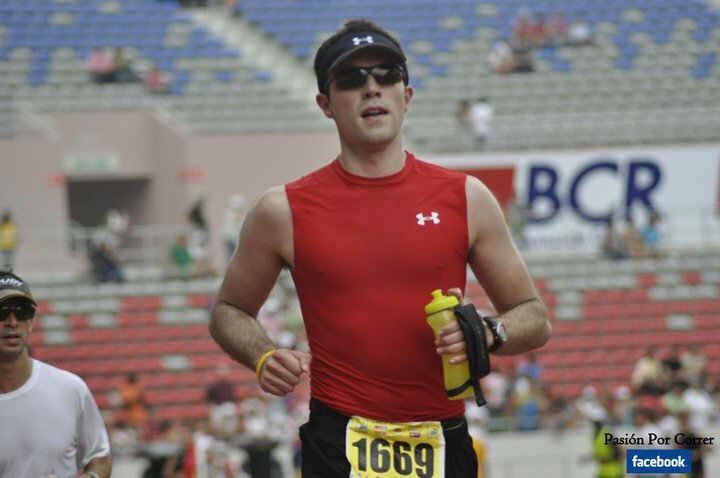 The thought of running in Costa Rica was definitely on my mind but there were always several obstacles to overcome. To elaborate on the challenge, let’s look at some of the greats. 2009 ING New York Marathon champion Meb Keflezighi and 2005 Chicago Marathon champion Deena Kastor both spend the majority of the year training at altitude in Mammoth Lakes, California. This allows their body to adjust to the challenging terrain, strengthening their blood’s ability to carry oxygen to their muscles and thus achieving a competitive advantage at lower altitudes, such as New York and Chicago. Similarly, marathon world record holder Paula Radcliffe trains in the altitude and heat of New Mexico and races more comfortably in cooler climates. 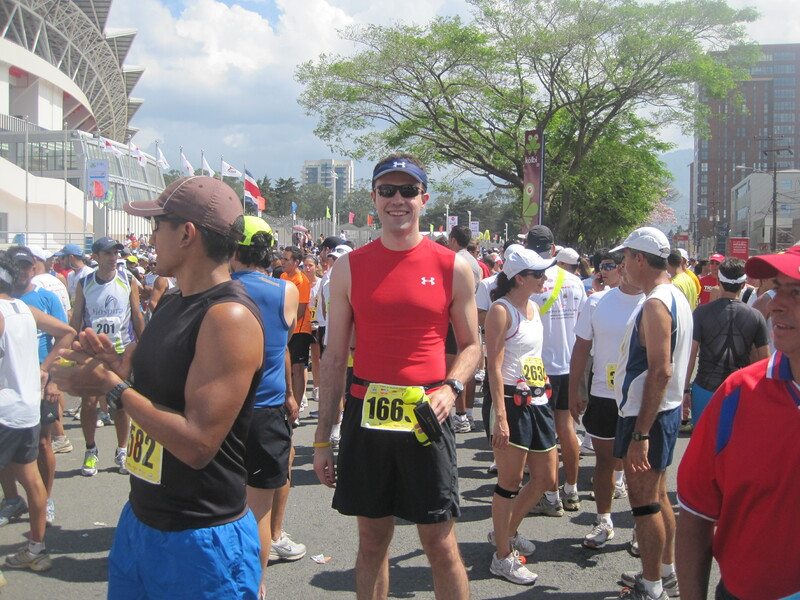 When I signed up for the 2011 Marathon Internacional Costa Rica, I was basically taking the opposite approach. Not only is Chicago virtually at sea level and laughably flat, but it’s chilly in March. San José is none of these things. It’s very hilly, nestled at around 4,000 feet and can be baking in March. So, given all of these variables, there was no way I would ever feel comfortable with my level of training before the race. That wasn’t my only problem, but we’ll get to that later. Under normal circumstances, I might have abstained from running this race. It was in the middle of a typically hot month and didn’t quite fit in with my marathon training schedule. However, the country was putting together the marathon as part of the inauguration ceremonies for a swanky new stadium in the heart of downtown San José. 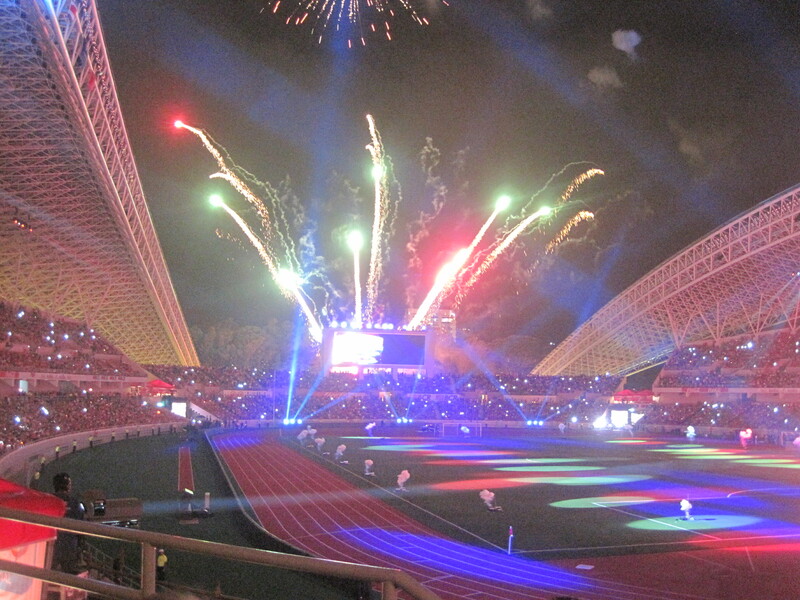 The events would include soccer games, concerts, and four different races, all of which ended on the stadium track. Given this once-in-a-lifetime opportunity, my decision was practically made for me. My friend Gabriel, who was with me in Austin last February, had purchased a stack of tickets to Saturday’s inaugural game against China, who basically built the stadium as a gift to Costa Rica. Though the game began at 8 PM, we found our seats an hour early and bore witness to a few Chinese dance numbers in addition to some pretty spectacular fireworks. After that, we were treated to a definitively lackluster game that would have been a victory were it not for the last-minute Chinese goal to tie the score at 2-2. I suppose it could have been worse, but Gabriel was understandably unhappy. 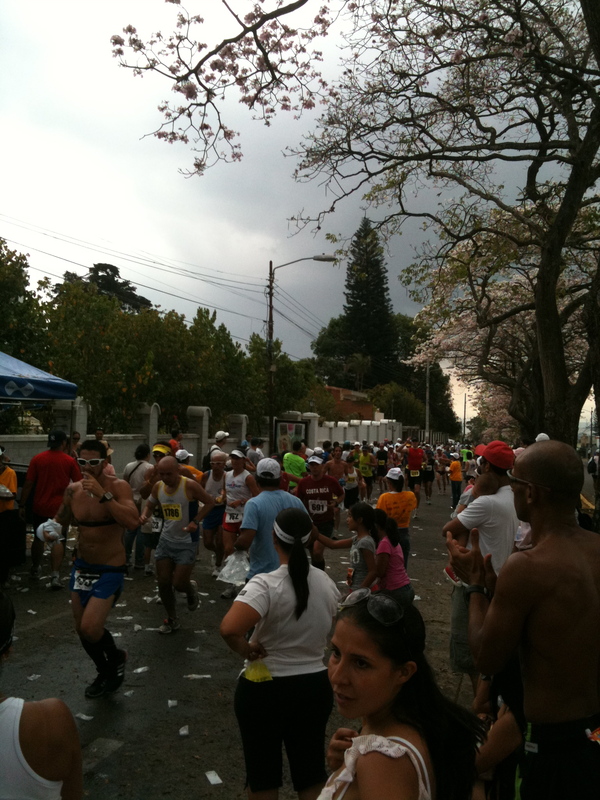 The festivities continued the next day with the marathon, marathon relay, half marathon, 8K and 4K races. Now, if you’re someone who has a decent number of races under your belt and you’re faced with booking flights for said event, it would be sensible and logical to assume that it would be held in the morning. If you have a job to go to on Monday, then a 5:35 PM departure time would allow you to race, relax, shower, eat and maybe even get an afternoon nap before having to head to the airport. But all of that foresight goes to hell when the organizers set the start time for 2 PM. The reasons for this counterintuitive schedule were many and the true one lost in the babble. I was planning on running a slow race, given the challenging conditions. Instead, I was now being forced to run under 1:55 to even have a shot at making my flight in time without showering. For the first time, my finishing time would have real consequences. I tried to change my flight but faced with fees up to $500, I decided, screw the system. I will find a way to finish that race and board my flight come hell or high water. Or maybe I’d just complain loudly enough at the ticketing counter and get put on the next day’s flight. Or [insert miracle here]. That miracle would come in the shape of Mr. Gabriel Golcher. His house was perfectly located not far from the finish line and he graciously offered it as a base of operations. But while one problem was solved, more obstacles appeared. One hour before the race started I learned that the half marathon was starting after the marathon. The organizers were stealing precious minutes from me but since this delay wasn’t jeopardizing anyone else’s flight plans, the complaints from the field were few. And yet, 2 PM arrives and the race announcer still hasn’t made up his mind as to which runners start first. Every thirty seconds he fires out a new lineup, but ultimately defers to the race organizers who yes, put the half marathoners last. 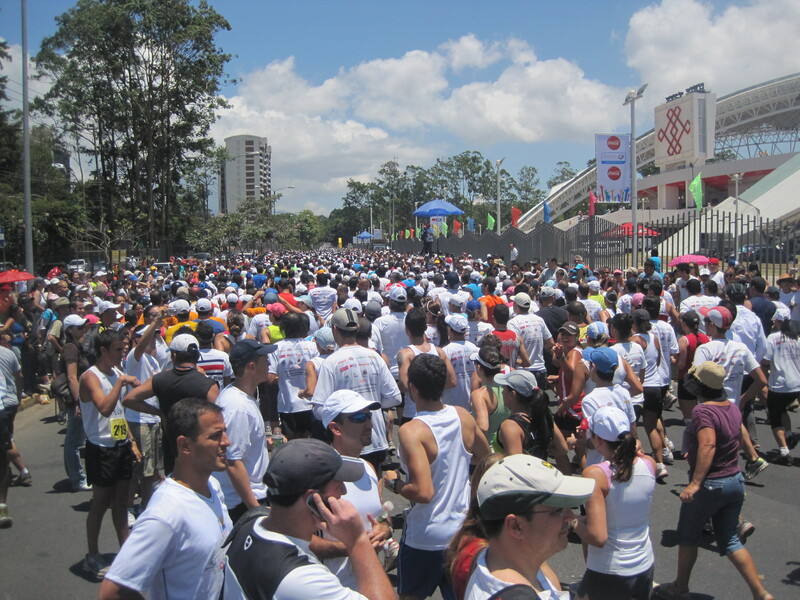 Around 2:05 PM, the former president of Costa Rica and Nobel Peace Prize winner Oscar Arias waved the checkered flag for the several thousand strong that were out to tackle at least 21.1 kilometers. The beginning was fun. Most races bunch up a bit around the start corral before everyone takes off at their race pace. However, the space was a bit tight and people were squeezing in very close to each other, as if at a concert. You couldn’t go any faster than the person in front of you and everyone was bouncing up and down to the tune of the start music. It would have been easy to complain but this party atmosphere was too infectious (but didn’t last long). 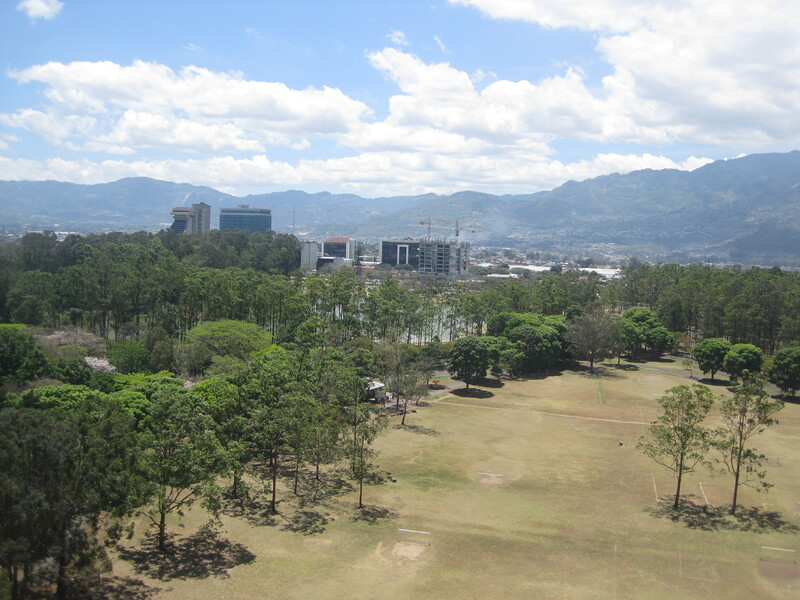 It thinned out about a minute into the race as runners head east on Avenida las Americas on the north side of La Sabana, a large recreational park in the middle of San José. The weather was harsh. Even waiting behind the start line, I could feel the heat on my shoulders. As we entered el Paseo Colón and later Avenida Segunda, shade was scarce. Though it was tough to ignore the heat, I still managed to absorb the race’s early stages and point out the logistical hiccups (which some might affectionately call “local idiosyncrasies”). For example, when the race zigzags from Paseo Colón to Avenida Segunda, many racers cut the corner. However, the leader of the race was already on his way back and faced many racers running right at him. Many spectators were also ignoring “typical” racing etiquette and were crossing the street in large groups and at pedestrian paces. 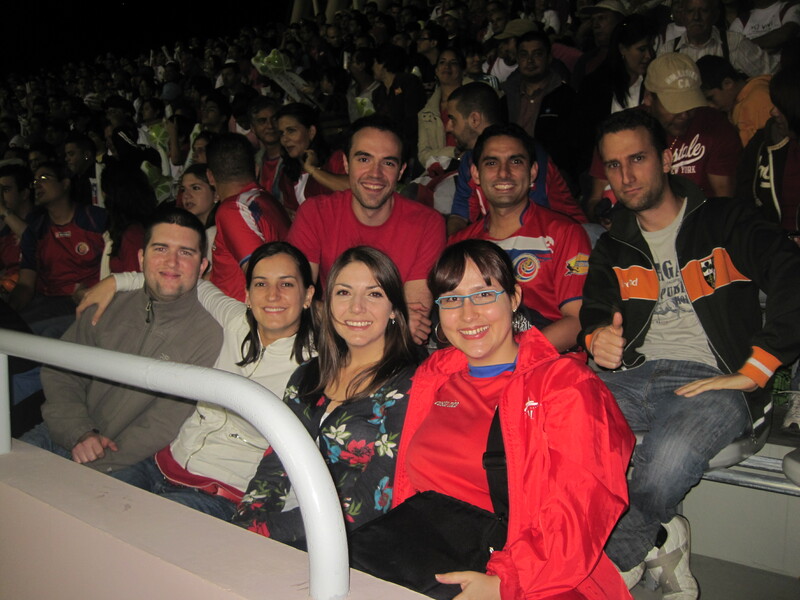 None of this bothered me; it just served to fondly illustrate Costa Rica’s nascent running culture. Once back at the perimeter of La Sabana around mile 4, giant clouds rolled over the city and blocked the sun for the rest of the day. From there it would be a 2-mile gradual downhill to the American Embassy. The streets were packed with spectators and in some areas, such as the beginning of the stretch down Pavas, they narrowed the course to only two shoulder widths. Water stations were eagerly handing out bolis, plastic pouches full of water that you tear open with your teeth and inevitably spray all over yourself and neighbors. The combination of great crowd support with the downhill slope made it easy to keep up a fast pace during this stretch. But what goes down must come up. The course eventually veers north toward el Boulevard de Rohrmoser, taking runners all the way back to the start of the course for the second circuit. Interrupted only once by a bridge, it is a constant uphill flanked by beautiful homes and divided by equally scenic trees. The top of the hill marks the end of mile 8 and the beginning of the second, shorter loop. After the long slog up the boulevard, I was panting and in no mood to speed up. However, once back on the downhill towards Pavas, I was back at my regular stride. Once again, the crowds were out in full force, keeping runners confident and facing forward. During this second loop I noticed that several water stations were completely tapped, which made me very grateful that I had brought a water bottle. It should go without saying that the second climb up el boulevard Rohrmoser was easier the first time around. I stopped to walk just before turning the corner to take a swig of lukewarm water before attempting the last climb of the day. I kept my sight slightly downward, staring at the pavement or at the feet of the person in front of me. I didn’t want to see how much more of the hill I had left and instead focused on moving my feet forward. I had carried the race with an 8:30 pace up until this point, but the two remaining miles would push it back to the 8:40’s, right as the course enters the new Estadio Nacional for the last 0.1 miles. Running on the track was pretty spectacular. Not only was it a remarkably soft surface, but it was great to see the panoramic views of the arched design with many supporters cheering for their friends and family. Finishing in 1:54:13, I grabbed my medal (which was actually more of a trophy) and continued running. 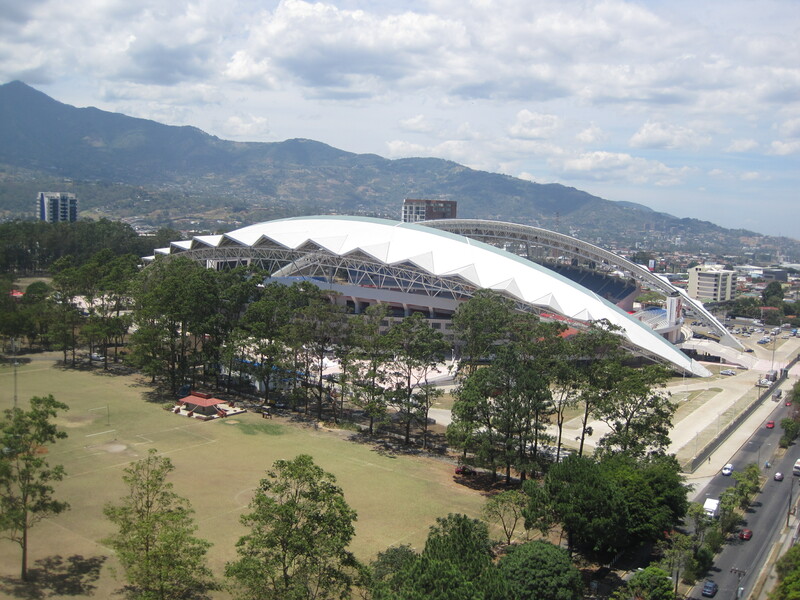 I had to dash out of the stadium, out of La Sabana and cut across the race course to make it to Gabriel’s house, where my parents were waiting to take me to the airport. It was 4:00 PM and my flight was leaving in 90 minutes. Since I had everything already laid out in its place, I ran in, bagged my clothes, showered and left within ten minutes. With my dad behind the wheel, we made it to the airport in about fifteen minutes, just under the cutoff for international flights. 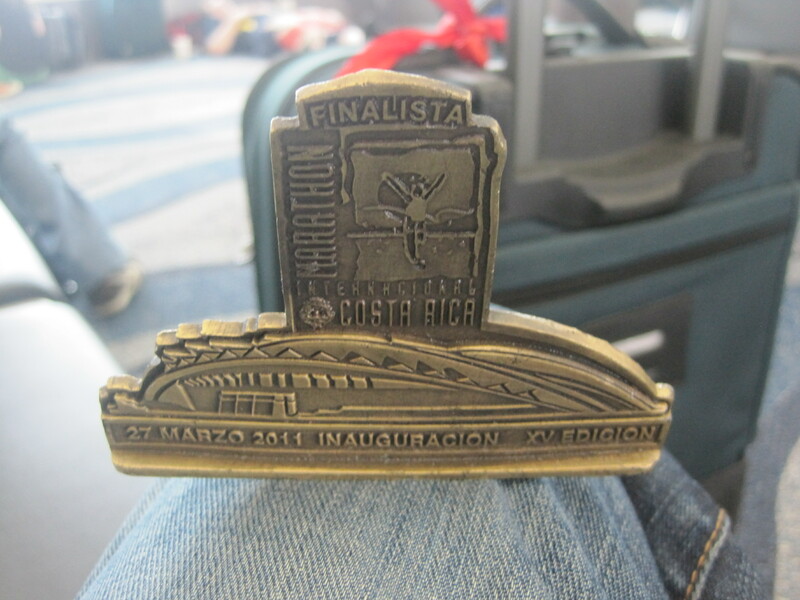 I must confess – though I was happy to run in Costa Rica and very proud of my finishing time given the circumstances, I was most thrilled about making my flight. It’s not that I wanted to leave Costa Rica, because that’s never the case. It was more about making sure all the meticulous planning, house-borrowing and hair-raising drive hadn’t all gone to waste. Though this race got me no closer to completing my goal of running in all fifty states, I wouldn’t trade it for the world. I certainly can’t speak for the majority of the field, but I personally had a great time despite the flaws and subpar organization. It’s the 15th edition of the Marathon Internacional, but it has never been this large, which goes a little way to explain the event’s faults. However, I’m glad I made it out to San José and into the stadium with 9,000 other ticos for what was, for better or worse, an unforgettable race. you are officially a crazy person. Way to go Danny! Congrats. Amazing! Great race recap and story!!! Not only all 50 states but different countries too! Thanks for stopping by my blog! Yes, I am on the quest for all 50 states either half, full or ultras! I have raced in Canada and will soon be ticking off a new country come October when I do the Loch Ness Marathon in Scotland! I look forward to following more of your blog! I love reading other’s stories of running and the quest for more states!